The oohs and ahs are almost as loud as if a celebrity walked into the room. Fish – implanted with RFID chips so they can be tracked and studied – fascinate geeky types and passers by. 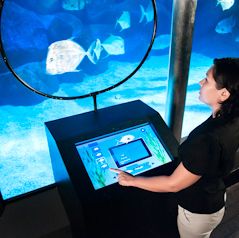 We should probably mention that the technology helps provide visitors with an interactive experience (translation: RFID is fun! ).